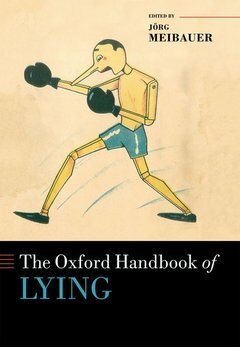 This handbook brings together past and current research on all aspects of lying and deception, with chapters contributed by leading international experts in the field. We are confronted daily with cases of lying, deception, bullshitting, and 'fake news', making it imperative to understand how lying works, how it can be defined, and whether it can be detected. A further important issue is whether lying should always be considered a bad thing or if, in some cases, it is simply a useful instrument of human cognition. This volume is the first to offer a comprehensive and up-to-date exploration of these and other issues from the combined perspectives of linguistics, philosophy, and psychology. Chapters offer precise definitions of lying and its subtypes, and outline the range of fields in which lying and deception play a role, from empirical lie detection and the acquisition of lying to its role in fiction, metaphor, and humour. They also describe the tools and approaches that are used by scholars researching lying and deception, such as questionnaire studies, EEG, neuroimaging, and the polygraph. The volume will be an essential reference for students and researchers in a range of fields who are looking to deepen their understanding of all aspects of lying and deception, and will contribute to establishing the vibrant new field of interdisciplinary lying research. Jörg Meibauer is Professor of German Language and Linguistics at Johannes Gutenberg University Mainz. His research focuses on cognitive pragmatics, with an emphasis on the grammar-pragmatics interface. His many publications include Lying at the Semantics-Pragmatics Interface (De Gruyter Mouton 2014) and he is the editor of multiple volumes such as What is a Context? Linguistic Approaches and Challenges (with R. Finkbeiner and P. B. Schumacher; Benjamins 2012) and Pejoration (with R. Finkbeiner; Benjamins 2016).